Aizawl/Agartala, Feb 12 (IANS) Massive demonstrations and protest rallies were held in Mizoram and Tripura on Tuesday to protest against the contentious Citizenship (Amendment) Bill. In Mizo National Front (MNF)-ruled Mizoram, the powerful Mizoram NGO Coordination Committee (MNCC) held spirited demonstrations in Aizawl and seven other district headquarters to protest against the controversial Bill. Protest rallies were also held in Bharatiya Janata Party (BJP)-ruled Tripura over the same issue. According to the police officials of the two mountainous states, no untoward incidents were reported from any of these two northeastern states. He urged the people to come forward in large numbers in protest against the bill, which according to MNCC supremo is against the interests of indigenous people of the North-East. The MNCC, which has more than four lakh members in Mizoram (the Christian-dominated state has a total population of around 11 lakh) had also boycotted the Republic Day celebration over the same issue. Special mass prayers are held in many Churches in Mizoram since Saturday for the defeat of the Citizenship (Amendment) Bill in the upper House of Parliament. Ruling MNF in the state also has been demanding of the Centre to withdraw the bill. Amid strong opposition by various political parties, including the Congress, Left and the Trinamool Congress, on January 8 the Lok Sabha passed the Citizenship (Amendment) Bill but it is yet to approved by the Rajya Sabha. 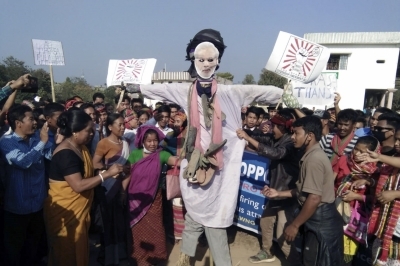 Protest rallies, spearheaded by newly-formed Movement Against Citizenship (Amendment) Bill (MACAB), were also held in some tribal-dominated areas of Tripura on Tuesday. The MACAB is a conglomerate of several NGOs and four tribal-based parties, including Tripura's oldest tribal party Indigenous Nationalist Party of Tripura (INPT). The Congress is also backing the MACAB. "Today's (Tuesday) main protest rally is being held in Jampuijala (in Sepahijala district)...," INPT general secretary Jagadhish Debbarma told the media. The MACAB and other tribal-based parties, including Tripura BJP's ally IPFT (Indigenous People's Front of Tripura), have also been agitating against the Citizenship (Amendment) Bill since January 8. Major political parties, NGOs and civil society groups are strongly opposing the Bill. Once a law, it will have a detrimental effect on the ethnic communities, they feel.